Being my first time to General Assembly, everything has been new and exciting. St. Louis is one of those cities that I had never been to but always hoped I’d get the chance to visit one day. It has not disappointed. Despite the high and constant adrenalin rush I have been on the first four days, Tuesday was the day I was looking forward to most. And, again, it did not disappoint. 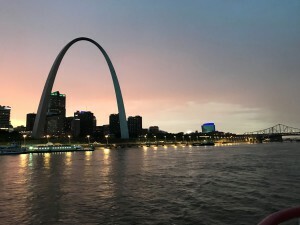 A riverboat cruise – on the Mississippi River that boarded at the Gateway Arch – was organized by West Jersey Presbytery and included our friends from the Presbytery of Donegal. But that wasn’t the high point of my day. Traveling 630 feet straight up to tour the Gateway Arch, providing breathtaking views of the city was not the high point of my day. Believe it or not, walking a mile in 95-degree heat was. 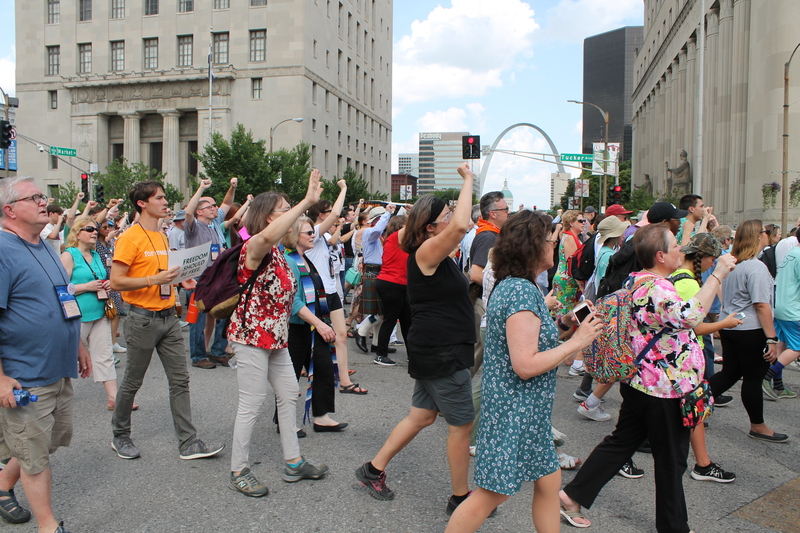 Several hundred Presbyterians gathered in the America’s Center before heading out in sweltering mid-day heat, lining up arm-in-arm in rows of six and walking down Washington Avenue and Tucker Boulevard to the City Justice Center in protest of St. Louis’ cash bail system. Hundreds of people are being held in prisons in the city with little chance for release because they are unable to pay the cash bail. An offering at GA opening worship, combined with online contributions, resulted in $47,000 being delivered to the front door of the Justice Center by Presbyterian Church (U.S.A.) Stated Clerk J. Herbert Nelson to help free persons who have been prescreened for release. Chanting “End cash bail – now!” and “No justice, no peace!”, just to name a few, this passionate yet peaceful mob traveled block after block down the city streets that had been shut down by local police. Many office building workers and retail shop customers came out onto the sidewalks to urge on the rally, which not only further united the Assembly but also tried to unwrite a wrong on this day. It received coverage from the city’s media outlets. Let’s hope this demonstration will lead to the end of a cash bail system that has been dismissed in places like Philadelphia and Washington D.C. in recent years. My morning began in the Mid Council Committee room as Synod minutes from around the PCUSA were reviewed. The Synod of the Trinity’s minutes came back in good standing, with the head of the review team praising the Synod’s granting opportunities while also commending the Synod on its “dynamic process of figuring itself out,” referencing the Synod’s recent change to a policy governance system of operation. Synods were asked to prepare a written report about the work they are doing in their region. They were also welcome to share a five-minute talk on the life in their region, but only six of the 16 synods chose to do so. Moderator John Bolt presented Trinity’s report, hitting many highpoints the Synod has experienced since the last GA two years ago. I also attended the Presbyterian Historical Society Luncheon, which featured a talk by Dr. Crystal Sanders, who is an associate professor of history and African American studies at Penn State University. She spoke about the obstacles education for blacks faced in the 1950s and ’60s and how far the black community has come since those troublesome days. It was also announced at the luncheon that the Historical Society has received a $285,000 grant from the Pugh Center of Arts & Heritage, which will allow the PHS to partner with the Community College of Philadelphia for archive-based learning that will help students learn how to do historical research and write papers, among other things. 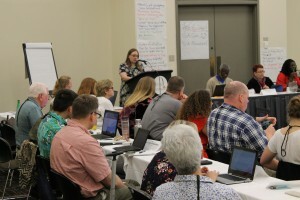 There were three commissioner resolutions prepared by people in the Synod of the Trinity that were discussed today, including one by the Presbytery of Donegal’s Emily Chudy titled “On directing the Office of the General Assembly to develop a plan for cost-reduction measures for meetings of the PCUSA General Assembly.” The idea is that by cutting costs of GA it will allow for lower per capita rates. “I’m concerned about how per capita will affect congregations and their programs,” she said. Emily suggested that meetings be held at colleges in smaller towns instead of at more-expensive conference centers in larger cities. Another suggestion is to have GA meetings every three or four years instead of the biennial cycle it is currently on. Tom Hay, the director of operations at the Office of the General Assembly, responded to Emily’s resolution by saying he was happy to see it on the docket, adding that he gives a lot of thought and time into trying to keep costs down for the Assembly. Holding a GA, which cost $2.8 million (half of which is spent on commissioner travel and lodging), at a college isn’t always feasible because of the distance between buildings that would be needed to hold all of the committees and other gatherings. “Most of what we do we have to do because of our standing rules,” Hay added. “I think there are lots of ways to cut costs. I try.” A unanimous vote will accompany this resolution to the coming day’s plenary.